Michele Crosera/AFP/Getty. Pictured photo by Jeff Wall. Is photography dying? No, not exactly. But the mysteries of the darkroom are by some accounts nearly extinct. And in the age of the smartphone, the art of photography sometimes seems to be vanishing in a cloud of digitalization, with the formal concerns that used to absorb even the sophisticated amateur dissolving as all images become more or less equal. Photography, not yet 200 years old, has already had an almost preposterously packed history, and now, several generations after photographers first claimed prime real estate in the museums and the art galleries, the old distinctions between photography and other media are eroding in a climate where many of the most influential artists use a variety of media, sometimes almost interchangeably. Getting a fix on the state of photography demands an improbable combination of the skills of both a social scientist and an aesthete, but people can’t help trying. Aperture, the magazine founded in 1952 in large measure to fight the battle on behalf of photography as an art, has now jumped into the breach, with a coordinated relaunch of the print magazine and the publication of the Aperture Magazine Anthology—The Minor White Years: 1952-1976, which surveys the best work from the first phase of the magazine’s storied history. Aperture’s spring issue rides off in half a dozen directions, and what may at first look like the bold strokes of an editorial team in full command of its powers pretty soon suggests the guy who is so determined to be the life of the party that he fails to notice that the party is over. In a prefatory note, editor Michael Famighetti and his colleagues announce that “all bets are on for the medium,” a remark I imagine would make any true gambler feel uneasy. They have given the nod to the latest in sleek high-kitsch photocollage by Michele Abeles, they reprise the mid-century snapshot aesthetic of Gary Winogrand, and they include an interview with Jeff Wall, the art world superstar whose large-scale photographs are often based on traditional paintings. I am left wondering if there is anything that the editors of Aperture don’t find to their liking, so that what they may regard as their openmindedness eventually seems a little like mindlessness. The issue is titled “Hello, Photography,” and I detect a note of desperation in the forced jollity of that greeting, as if photography were some monster to be assuaged with a show of good cheer. The desperation is not unfounded, because in a world where photographic images are ubiquitous a photography magazine can seem redundant if not irrelevant. Michael Abeles. Progressive Substitution Drills. 2012. Pigmented inkjet print. 37 1/8 x 27″. The interesting thing about the old Aperture—with a design that was as elegant and ascetic as the new magazine is brash and bold—is that White and an inner circle that included the photographer Ansel Adams and the historians Beaumont and Nancy Newhall were always grappling with photography’s ubiquity and how they might discover within that ubiquity something unique. Nancy Newhall sounds almost astonishingly contemporary when she writes, in the very first issue in 1952: “Perhaps the old literacy of words is dying and a new literacy of images is being born. Perhaps the printed page will disappear and even our records be kept in images and sounds.” She does not rage against this possibility so much as she suspects that we are not quite ready for it, because, as she says, “We are not yet taught to read photographs as we read words.” Of course reading, whether of photographs or words, ought to be an active process, grounded in fundamental decisions about what to read and how to read it. In 1962, White published an essay on the question of how people react to photographs, including comic vignettes of various responses, including those who exclaim “I Just Love It!” or “It’s Been Done Before” and personalities he dubbed “The Changers” and “The Bluffers.” He wanted viewers to grapple with what was there in the photograph, but that doesn’t really answer the question of what to do when there’s very little there there. 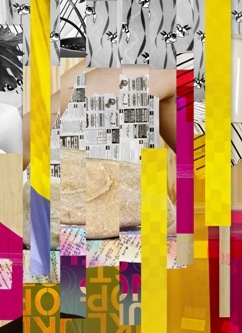 The re-launched magazine features close-up studies by Christopher Williams. The new issue of Aperture is certainly not without its flashes of stirring intelligence. Jeff Wall is a man of enormous discernment, and when he speaks of “those little voids in the canon that can still disturb the consensus of what is worth bothering to photograph,” I find something heartfelt in what is basically a struggle to find room for innovation even as one acknowledges the pressure of tradition. 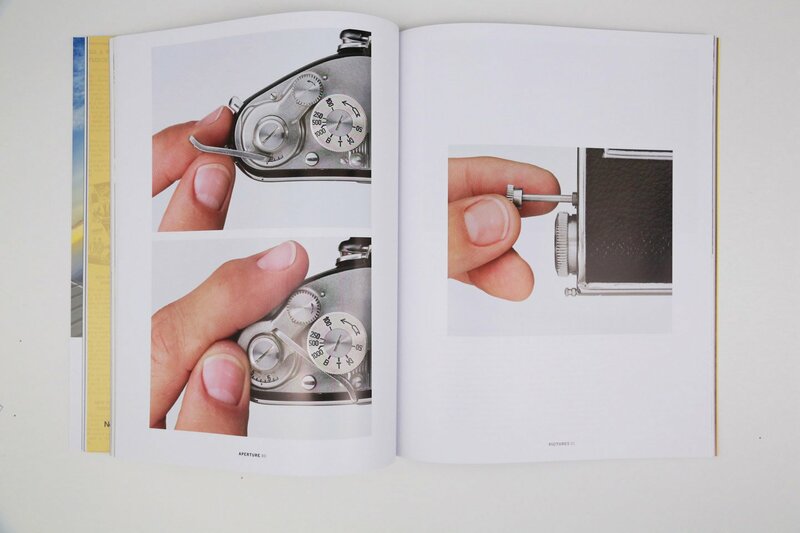 Of the new photography in Aperture I am most taken with Christopher Williams’s close-up studies of a hand manipulating the dials and sundry moving parts of a rather elegant mid-twentieth-century camera known as the Exakta. Although there is perhaps something a little self-conscious in Williams’s reprise of the close-up lucidity of 1930s New Objectivity photography by Albert Renger-Patzsch and others, Williams’s images have an invigorating physicality that gives their unabashed nostalgia a pleasurably clear-eyed power. As for some of the other new work gathered here, I don’t have anything good to say about Michele Abeles’s juxtapositions of naked flesh and a miscellany of patterns and textures, or what Andrew Norman Wilson refers to as his images from Google Books “in which software distortions, the imaging site, or the hands of the Google employees doing the scanning are visible.” Both Abeles and Wilson strike me as having little commitment to photography as a medium. Their digital-inspired games—which in Abeles's case are mixed with elements of old-fashioned studio photography—are as detached from photography’s heartfelt interchange between image and reality as the digital games of Wade Guyton, who makes prints on canvas from images generated with a software program, are detached from painting as a freestanding activity. Of course Guyton, who had a much-discussed one-man show at the Whitney Museum of American Art last fall, is in many quarters seen as the latest savior of painting, so why shouldn’t Abeles or Wilson, with their digital shenanigans, be seen as saviors of photography? To the editors at Aperture, with their argument that “all bets are on,” the answer would be, “Why not, indeed?” But if there is a parallelism between the state of photography today and the state of painting today, it would seem to me to be that they share a need to pay ever-increasing attention to what is intrinsic or inherent to each medium, although there will be as many different answers to that question as there are artists who are willing to ask it. Digitalization can become a form of intellectual obfuscation. When the editors at Aperture observe of their new issue that “the definition of photography, always multivalent, charting a promiscuous course across disciplines and contexts, feels especially slippery now,” I am left wondering how closely they have looked at the writings in the Aperture Magazine Anthology, which has been beautifully edited by Peter Bunnell, the historian who worked with White as a young man. Reading through the anthology, you can see that the slipperiness was there from the very beginning; indeed Aperture was founded to make an argument against the dominance of photojournalism and in some sense reinvigorated the argument for photography as art that had animated Alfred Stieglitz’s Camera Work decades earlier. An untitled Wade Guyton work from 2006. Little good comes from celebrating the slipperiness of experience, unless you happen to see some advantage in falling flat on your face. The great thing about the Aperture Magazine Anthology is how alarmingly fresh it sounds, with all the talk about the paradoxical relationship between nature and abstraction in photography and the contributors' unabashed frustration with the public’s tendency to regard photographs as little more than replicas of reality. Frederick Sommer, a photographer whose work is sometimes as remote from ordinary reality as anything dreamed up in the digitalized imaginations on display in the new issue of Aperture, announced in Aperture in 1971 that “It is with sensitized surfaces, rather than with photography itself, that I am concerned. The sensitized surface has an honesty, an inevitableness; it just can’t do anything else.” Of course the literally sensitized surface was a function of the old analog photographic technology, and that is more and more a thing of the past, although there are stalwart practitioners and there will continue to be. Nevertheless, I think that something in Sommer’s idea of the essential sensitivity of photography as a method and a medium offers a key to the future. What is lacking in a lot of the new digital hi-jinks is precisely this abiding sensitivity to the way that the world affects the artist. Many have argued that the origins of photography are to be discovered well before Fox Talbot and Daguerre fixed an image in the 1830s, going back to the realization by earlier generations of scientists and dreamers that certain light sensitive substances can actually register the shadows and silhouettes of objects. Children still embrace this primal photographic magic when they make blueprints of leaves and flowers. Sommer would argue that the essence of photography is not its capacity to mirror the world, but its capacity to fix that fleeting image. Many people can see clearly, but it is the photographer who registers the experience of sight, turning images into afterimages. At the end of the day, the photographer is the sensitive surface, receiving the impact and imprint of an experience. What is photography without the honesty and inevitability of the sensitized surface? Photographers may well do without the print’s slow emergence in the chemical bath in the darkroom, but as a guiding metaphor the sensitive surface remains as honest and inevitable as ever.